← We Were Interviewed AND Started a New Show! Arriving today in comic shops all around is the latest issue of Dark Horse Presents. I’ve talked before about how DHP is, hands down, the best anthology on the market and today it gets better with the return of indie comics legend: Nexus. 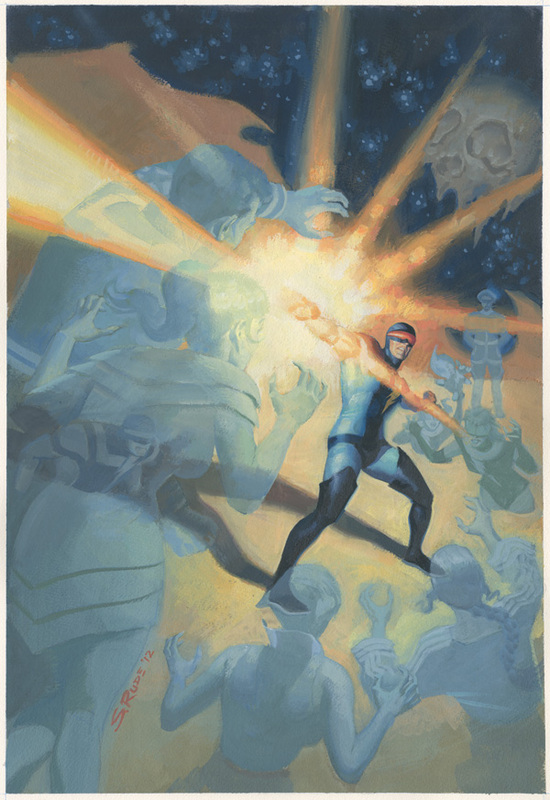 I got the chance to talk to the co-creators of Nexus, artist Steve Rude and writer Mike Baron. Check it out! GCC: What do new readers need to know before coming into the world of Nexus? Rude: A “Space Soap Opera” is one description of Nexus, as the name of our last 4-issue mini-series had proposed. Baron: Nexus dreams of mass murderers. When he wakes he is compelled to seek them out and kill them. For a long time he was at the mercy of the insane alien Merk but since then they’ve worked out a deal. Nexus is a cosmic avenger. 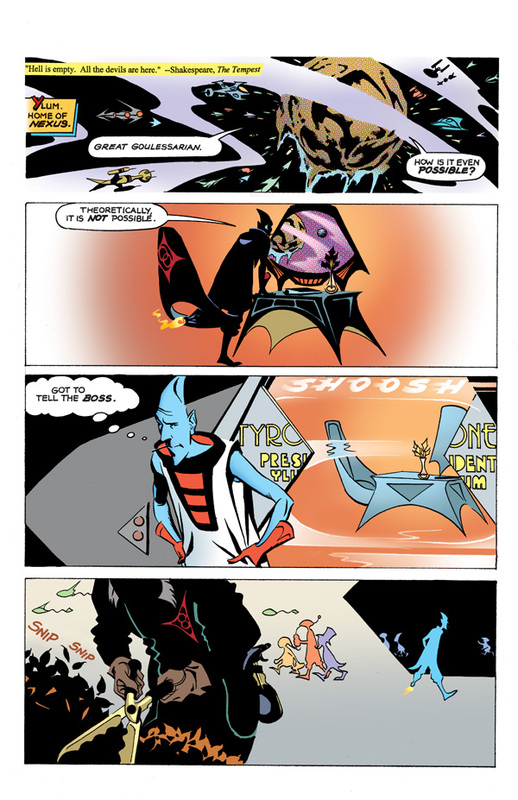 GCC: What can readers can expect from the return of Nexus in the pages of Dark Horse Presents? Rude: I’d say you can expect to be “surprised”, just as we creators are often so surprised as they uncover the twists and turns that surprise us. Baron: Thrills, drama, heartbreak, comedy. GCC: Mr. Rude, do you work pencil and paper or digitally? What do you think are the advantages of how you work? Rude: All my tools are the ones I’ve worked with since kindergarten, grade school, right up to when I woke up today; actual paper, pencils, and ink…and my good right hand. Only the coloring on Nexus, c/o Glenn Whitmore, is done on computer. My covers, too, are and always will be hand-painted with brushes and my various chosen mediums. GCC: Mr. Baron, have you changed the way you tell the Nexus story in this new adventure for new readers or for the shorter format of Dark Horse Presents? Baron: Yes. I originally conceived the first three stories as ten pagers because I was STOOPID and never looked at a copy of Dark Horse Presents. I am now writing eight pagers. In the past, I used to draw each page out by hand with my crude art and all captions and dialog. I no longer do that because it messed up my back. I now write full script. GCC: What were both of your inspirations going into Nexus back in 1981? How have those influences changed over the years that Nexus has been around? Baron: I am less interested in my emotions and much more interested in the characters’. My inspirations are the whole panoply of pop culture–the whole shebang—music, books, art, movies, dance. 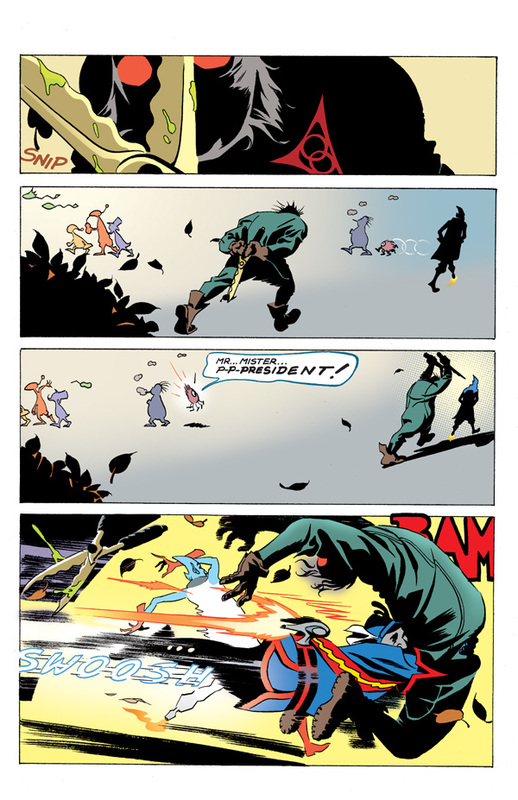 When I began I emulated my heroes–Carl Barks, Steranko, a thousand others. Now I just write. The most important thing is to know what happens next. It has to be exciting–it has to make sense in the story context and for the characters. Rude: Perhaps surprisingly, perhaps not, my influences haven’t changed from the time Nexus debuted in ’81. They may have grown even stronger. They’re still Kirby, Gulacy from Master of Kung Fu, Space Ghost cartoon shows, and the original Capt. Kirk helmed Star Trek. GCC: Beyond the story appearing over the next few issues of Dark Horse Presents, are there any plans to return to Nexus in an issue-length form? Baron: In fact, we are embarking on a graphic novel that will unfold within the pages of DHP in 8 page increments until the story is finished. It is a huge story spanning galaxies and time itself with some surprising guest stars. Rude: One of the benefits of the brief, 8-page installments that will first be presented in DHP, is to eventually have these stories collected into a straight, 24-page comic. They can then be read in a less condensed format, as most of our Nexus tales were intended to be shown. GCC: Mr. Baron, your Nexus co-creator has been called Steve “the Dude” Rude for some time. If you got to pick a nickname for yourself, what would it be? Rude: I’ve always just called him “Baron”. GCC: Finally, a must-ask geek question: if you could choose any superpower, what would you go with? Rude: I would go for spider-powers. Thanks again to both Steve Rude and Mike Baron for talking with me and, as always, to the awesome Aub Driver and the rest of the Dark Horse team. Head to your local comic shop and grab Dark Horse Presents! This entry was posted in Interview and tagged champion!, comics, dark horse comics, dark horse presents, interview, mike baron, nexus, steve rude. Bookmark the permalink.